Cinnamon is a Linux desktop that offers advanced innovative features and a traditional user experience. 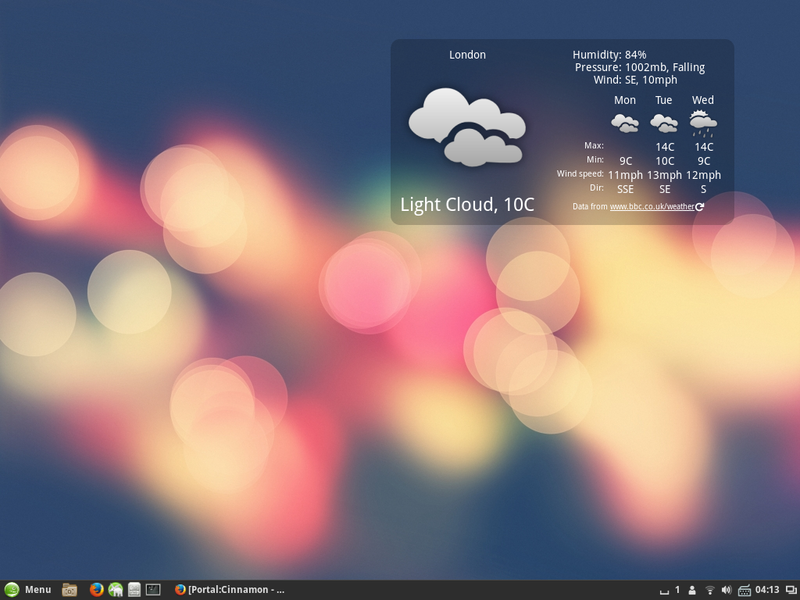 The layout of the desktop is similar to what we have MATE and its predecessor: GNOME 2.x. The underlying technology is derived from GNOME Shell, with the emphasis placed on making users feel at home and providing them with an easy-to-use and comfortable desktop experience. Cinnamon is the default desktop environment for the Nelson GNU/Linux-libre distributions e the Linux Mint distributions. Chromium, Chrome, Opera users will have to download the .ymp file and then execute it locally by double clicking on it or use Epiphany, Qupzilla, Firefox in order to directly execute the file. *-devel, *-debuginfo, *-debugsource packages are not required by default. They are mostly needed to track issues and bugs. Users who employ English as their sole desktop language do not need *-lang packages and cinnamon-translations. Installing these packages will require Cinnamon to be localized. Manual installation of typlib-1_0-* packages is not required. If needed, they'll be automatically pulled in. The same applies to lib* packages. cinnamon : Core package providing the desktop shell. cinnamon-control-center : needed to be manually installed, otherwise Cinnamon will be failed and fallen back, under an experience from a SuSE studio user. cinnamon-screensaver : Screensaver for Cinnamon, to be a dependency. cinnamon-session : Package that enables the user to log in to Cinnamon, to be a dependency. cinnamon-settings-daemon : no manual installations to be required, which will be pulled in automatically and it's essential for Cinnamon. muffin : the window manager by Linux Mint similar to mutter for GNOME. It is an essential and dependent package. openbox: an alternative window manager, not required here but required to make use of Cinnamon at Fedora. mdm (officially missing in Tumbleweed) : Mint Display Manager. mint-mdm-themes-* (officially missing in Tumbleweed) : Themes for MDM. nemo : File manager by Linux Mint, which is a dependency making use of cinnamon-session. nemo-extension-* : Various Nemo extensions. Each package is named after its function. python-nemo : Python bindings for nemo. Doesn't require manual installation. Warning: running that command may black and freeze your X! Save your work before running it! and you must know how to switch to tty, init 3 && init 5 to get back! Warning: remember to `sudo systemctl stop NetworkManager` if you have any working network connection. Cinnamon will seek control of network, which conflicts with your working GNOME-shell(they both use nm-applet)...so don't give them any network both! Or you'll surely fail because cinnamon can't start with a running NetworkManager! We need that journal.log and .xsession-errors-:0 inside your home directory. If your cinnamon workspace is wrong (eg, some applets can't be loaded, some extensions can't be enabled), can you please press "Meta (the Win key) + L" to trigger Cinnamon Looking Glass and tell us the output under the Error tab? Spread words to other users to form a cycle inside our big community. Let's just keep barking. Testing (Install the ones from our devel repository). Watch this project to prevent it from being inactive again! Seriously, I have a more important responsiblity to hold, which is M17N the input methods thing...and My own desktop environment is actually KDE...so this one person job may ends someday really. You can apply some permissions like developers' do (see below, but don't touch around directly, fork a branch first)! Just in case if no one is still here, you can wait and hand the develop permission over to other capable hands who wish to help. Send your branch to X11:Cinnamon:Factory using BURP way. Send your package to X11:Cinnamon:Factory on Build Service. Or: Join us to fix those unbroken things (well, sometimes it does breaks!) to get a better user experience! Spread the word and attract some users to be our testers. A wallpaper set (several images with ultra-high resolution support, find them on DeviantArt or hold an contest ourselves). We may not use official openSUSE wallpaper if it doesn't fit...with MargueriteSu Talk - Contributions's design capability, we can create our own. A gtk3 theme. To be forked from Numix. May provide dark/light variants. A Cinnamon itself theme like KDE plasma workspace theme. May provide dark/light variants. An icon theme. Ask from users (forum/G+/IRC #opensuse-gnome, just spread the word). Deviant is not reliable (some theme looks superb, but with only less than 50 icons, it even lacks of a default "folder" icon! ), while gnome-icon-theme/mint-x-icons is also ugly. Warning: Note: We will not maintain/keep packages for EOL releases. eg: when 13.1 reaches its EOL, all related repositories will be cleaned. You're encouraged to use with openSUSE Tumbleweed. Permission Placeholder: A place to ask for maintainership, Just send an add_role SR in it. cyberorg Talk - Contributions – Initial packages. ketheriel Talk - Contributions – Cinnamon 1.2 packages. MargueriteSu Talk - Contributions – Cinnamon 2.0 - 2.6 packages. Welcome to join! Just read the `help us out` section in the left. Warning: Don't contact our individual team members unless you're told to. Let's be "default to open". Personal e-mails can't help others. You can meet us at: #opensuse-cinnamon channel on freenode. If nobody's there, go to #opensuse-mate or #opensuse-gnome… we might be visiting our neighbors. You can open a bug report on openSUSE's bugzilla and assign it to "sor.alexei#meowr.ru" and "i#marguerite.su" (replace # with @). But don't report bugs directly to that e-mail address. You can write to #opensuse-factory mailing list (sorry, we don't have our own yet). You can yield at openSUSE's GNU social group or Google+ community. Send to GNU social or Twitter or set it as your Diaspora* or Facebook status. Tell people around who actually can't help to scare them not to use us. This page was last modified on 21 July 2014, at 08:09.